Anyone who knows me knows how much I constantly rave about my Instant Pot and how life-changing and revolutionizing that method of cooking has been for dinner time at our house. As a matter of fact, I’m STILL happy dancing all over the place over how great my Instant Pot is, especially when it comes to the 5 things I cook most often in it: meats, soups, beans, grains, and pastas….all of which can be cooked in mere minutes instead of hours. I’m not sure if my hesitation was because I felt like I was being unfaithful to R2D2 (my beloved Cuisinart electric pressure cooker) or if it was just because I struggling to commit to yet ANOTHER small appliance that would require taking up more space on my counter top, not sure. 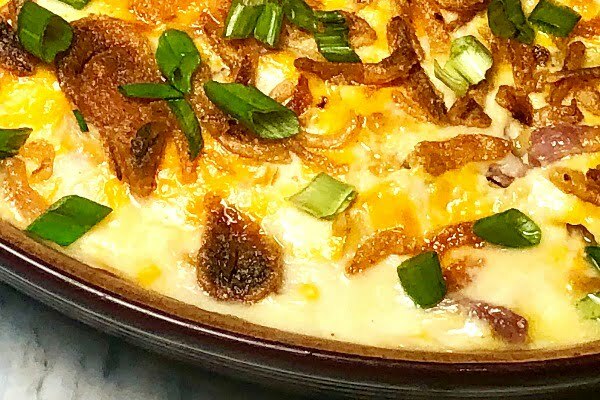 When your heart is longing for something with a crunchy, crispy exterior…..such as onion rings, French fries, fish sticks, and pizza, an Instant Pot isn’t really the ticket. But, goodness! An air fryer sure does the trick. We’ve had a good bit of trial and error as we learned to air fry over the past few months, but it’s been exciting to see how crispy everything gets without all the oil required for deep-frying. Plus, we’ve been pleasantly surprised at how many different things we can cook in it. We are in love. Because air frying uses circulating hot air and not oil to cook our favorite fried foods, we are consuming less fat and calories without sacrificing taste and texture. Everything gets crispy and browned and wonderful and nothing is submerged in oil like when you deep-fry. Do you realize that an air fryer isn’t used just for FRIED foods? We can use it for grilling, roasting, and baking as well. I recently baked a deep-dish quiche in just 25 minutes, some angel biscuits, a pan of breakfast cinnamon rolls, and also made Chicken Chimichangas that everyone loved. Impressive. No preheating is required for our air fryer! What a definite surprise AND A bonus. You just turn on the air fryer and pop in your food – the air fryer is instantly hot. Talk about a huge savings of time. 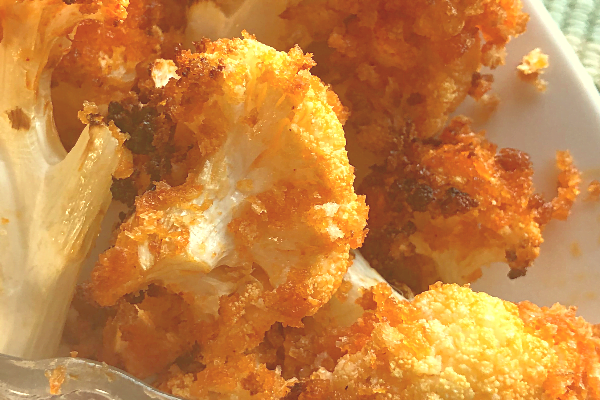 I think this is mainly why my sons and husband have adapted to cooking in the air fryer so quickly – they definitely love the speed and the crispy-ness that the air fryer gives them. Foods do cook much quicker in an air fryer. Score! Is there anything worse on a hot summer day in Kansas than to have to turn your oven to cook dinner?? With the air fryer, all the heat is contained in the unit. We love how we can cook a hot dinner any time of the year…without heating up the entire kitchen! I don’t know about your family, but mine is often eating at all kinds of weird times of the day and night, even though we do try our best to sit down together for a meal as often as we can. I call it “shift eating” and because of this, the air fryer is really quite perfect for our family of 5 since it’s often just one or two of us at a time that are eating. Nobody feels bad about cranking up an air fryer (as opposed to a big oven) when you’re cooking for just one. And this may just be what I’ve realized is best of all. Why? Well, I’ve noticed that I’m not throwing out a bunch of leftovers that have been abandoned in the fridge, like usual. An air fryer magically makes your leftovers “like new” again! Pizza is crispy once more (instead of soft and mushy as when you reheat it in the microwave), quiche gets a little bubbly and golden on the top, and left over french fries are perfect again in just a couple of minutes. What are the Main Objections That I’ve Heard from Other Air Fryer Owners? “It’s too small” is hands-down the number one objection I’ve heard over and over. And, if you happen to have a large family that doesn’t eat in shifts like mine does, the air fryer probably isn’t for you. You can’t cook large quantities of food in an air fryer, and that’s a fact. Which Air Fryer Should You Purchase? There are a couple of things to consider when purchasing an air fryer, and size is definitely one of them. I’ve talked to a lot of folks who love their air fryer but wish they would have purchased the bigger size up front. Because they love the air-frying process as well as the crispy food textures, they wind up purchasing a second (larger) air fryer pretty quickly. Keep in mind that if you get the big one right off the bat, you don’t HAVE to cook large amounts of food in it…..you’ll want to, but you don’t have to! There are lots of different brands of air fryers to choose from. I’d read the reviews on Amazon and talk with friends you know who already own an air fryer to get their feedback. I love Cuisinart products, so I knew I wanted to go with that brand and the largest size. I also like it that the Cuisinart air fryer I have can be used as a toaster oven, as well, making it even more useful. Just like with any new kitchen appliance, don’t be afraid to try it out as soon as you purchase it. Nothing is a failure if you LEARN something from it, and that includes anything you COOK. Don’t be afraid to experiment. Try new things and see what you like – I bet you might just be surprised. Okay. This is where you get on your horse and go buy an air fryer. Just know he’s going to make his mark on your life, so get ready. You’ve been warned. 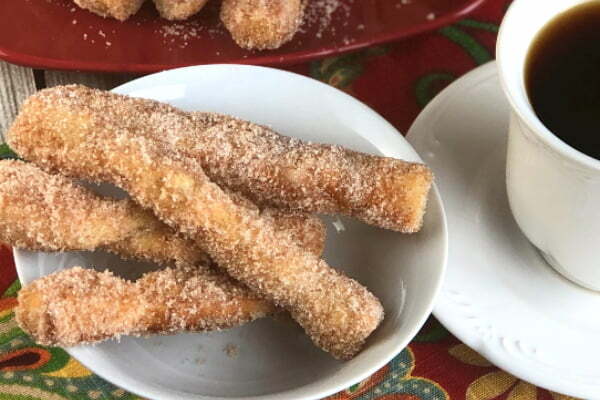 Our family loved these Air Fryer Churro Stix and also this Buffalo Cauliflower!